Using k6, developers can run fast, daily load tests, on their own machines (local testing, behind the firewall), as part of their Continuous Integration process. QA testers can run more complex tests in the cloud with LoadImpact Cloud Execution. LoadImpact Insights lets your team store and analyze results and see trends. 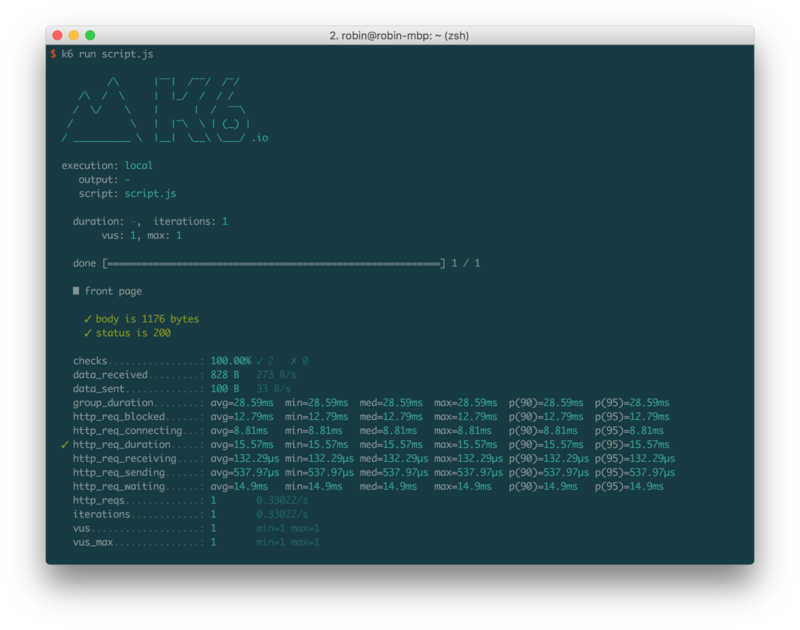 Run k6 tests from your local machine to debug a test script or to get quick performance feedback before pushing code to version control and CI. Run on LoadImpact's global cloud infrastructure to scale out to much larger tests-- up to 5000 Virtual Users (VUs). Avoid the hassles of managing the cloud infrastructure for performance testing. Generate test loads from up to 10 different geographically different global locations. Checks (like asserts) are used to validate functional aspects of your test. Thresholds are the essential feature that you use to specify the pass/fail criteria of your tests. You can create thresholds based on any of the standard metrics collected by k6, as well as any custom metrics that you define. Ready for the present and the future – k6 supports performance testing of systems that talk HTTP/1.1 HTTP/2 and WebSocket. Download the latest k6 binary from Github. 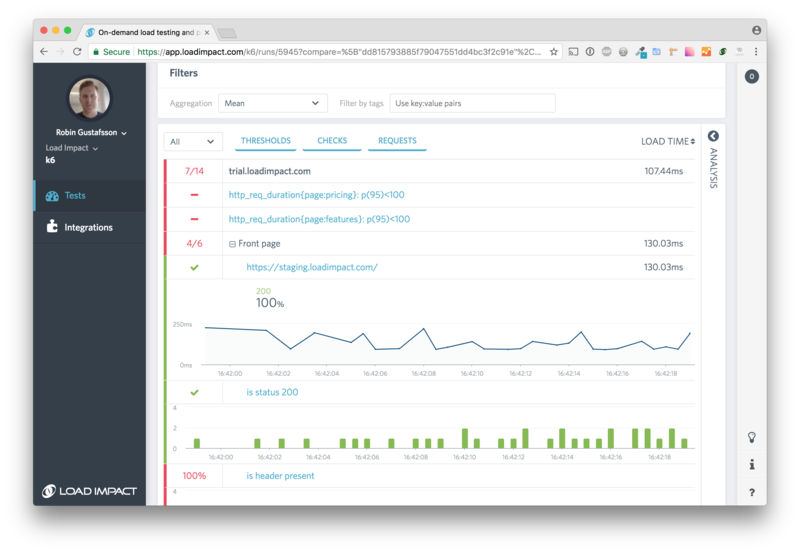 You can run k6 load tests from anywhere; the results can always be streamed and stored in the cloud using LoadImpact Insights. A performance test can generate a lot of metrics data and it can be time consuming to manually look through it all. That's why we have condensed our performance testng experience into algorithms that analyses your results in real-time and surfaces issues in the form of alerts. You have access to all your metrics that k6 reports in Insights, including URL and group response times, global and per-URL request rates, data sent and received as well as any custom metrics that you've defined in your script. All metrics can be filtered based on tags that you have defined in your scripts. You can even tag individual requests or custom metric samples and retrive those through Insights powerful tag filtering. Start a test and let us notify you via Slack, HipChat or a Webhook when it's done. If you have also setup thresholds the notification will also tell you whether the test passed or failed. As code is being deployed at an ever increasing pace, it's not only important to make sure you have the necessary performance gatekeeper steps in your automation pipeline set up. It's equally important to understand how your system's performance is changing over time. With performance trending you get an overview of how the performance is changing over time, across test runs. Whether you run your tests from a machine that you manage or using LoadImpact Cloud Execution you can easily integrate performance tests into a CI service like CircleCI, Gitlab CI and Travis CI or on-premise solutions like Jenkins CI and TeamCity CI.